running | brian habbe | life .. This weekend was the Purity Moosic City 5k/10k Run at Metro Center in Nashville, TN. 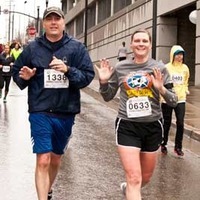 I haven’t ran much since the Predators 5K a few weeks ago and didn’t know what to think about signing up for the 10K. If there was a benefit to having 3 hockey games last week it was decent training. The first mile wasn’t good but it got better after that. I finished at just over an hour, 1:04 I think. I can’t remember the last time I went for a solid hour without stopping at anything let along running. Hockey is a little different even though games will go an hour we’re only on the ice for a minute at a time. Kay has run this a number of times but it was my first. Course was flat and the weather was good, not to hot and not to cold with a breeze. The best part was the ice cream sandwiches after the finish, excellent!! Hoping I can give it a go next year. Saturday (5/1) was my first 5k run. Of course it took some incentive to get out there, and i didn’t run the entire time. It helped that friends were doing the run/walk thing and I didn’t have to keep up with Kay. I’ve never been a runner but it was fun. Not sure where it will go from here but we’ll see.